This is Dragonsong. The book that, for me, started it all. I was on holiday in Llangollen, because that's where I spent all my childhood holidays, but this one was more exotic because we were also going to spend a few days by the sea in Prestatyn. We stopped off to see my Grandparents on the way, and Grandma gave me three books. Dragonsong, Dragonsinger, and Dragondrums. 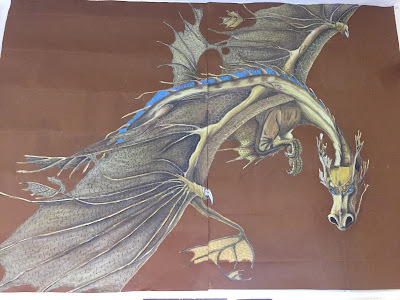 She explained to me that there were dragons and that they breathed fire to burn an evil thread that fell from the sky and destroyed everything, and that they were ridden by dragon riders who communicated with them telepathically. She thought I'd like these books particularly because the main character was a girl who was extremely musical, and over the three books she got to go and study at the harper hall. She was right. I started reading for the music angle and then stayed for the dragons. Then my grandma gave me other books in the series (which I'd later found out she'd gotten from my uncle and auntie), and then I was hooked and bought myself the other books. Isn't it amazing? It's Ramoth, a queen dragon (all queen dragons are gold in the Pern novels) from the same era as Dragonsong.